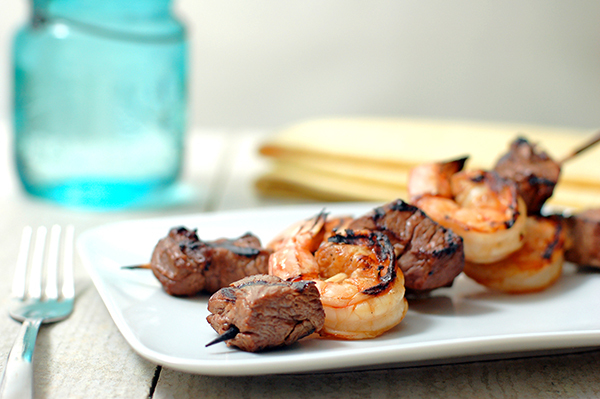 Turning on the grill for a little surf and turf this Fourth of July? This healthy recipe for kabobs will satisfy any meat lovers at your backyard party! Throw a couple veggie kabobs on the grill as well to round out the meal! 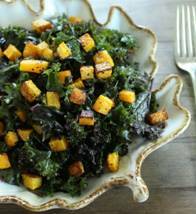 Loads of spices and fresh vegetables make this dish with kale really stand out! 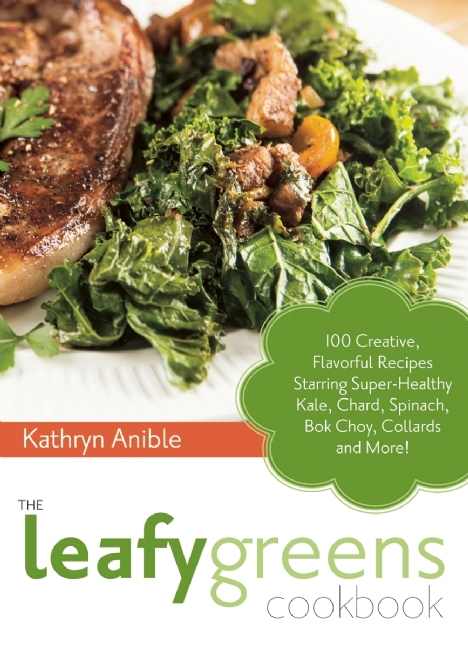 For those new to eating kale, this is a nice way of introducing it into the diet. Preheat oven to 350°F. Top and tail the squash, halve it crosswise, put each piece flat-side down on the cutting board, and peel with a sharp chef’s knife. Remove the seeds with a spoon, and cut the squash into 1-inch cubes. Place in a large bowl, toss with the 2 tablespoons olive oil and season lightly with salt & freshly ground pepper. Spread on a parchment-paper covered sheet pan. Roast 20-25 minutes, until the squash is tender and starting to brown. While the squash roasts, strip the kale from it’s ribs (easy to do by just running your fingers along the rib on both sides, bottom to top), wash it well, and cut into fine ribbons. Mix with the olive oil in a large bowl, and rub and massage the kale until it softens, about 2 minutes. Make the sauce by combining the ingredients in the food processor. Pulse to puree to a sauce consistency. Combine with the softened kale. Toss the hot squash with the sauce and kale, and serve. One of the beauties of this dish is that it is still delicious served warm or cold and still wonderful the next day. 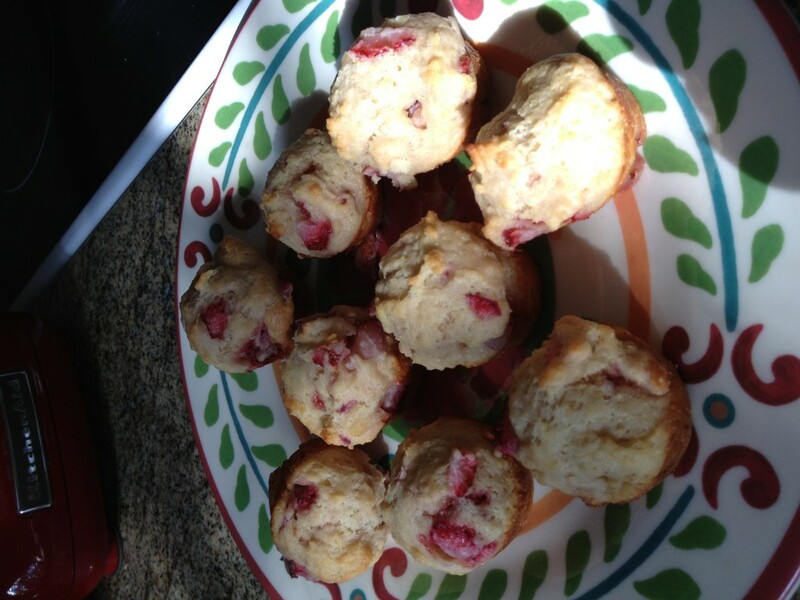 When it is raining outside this summer, get the kiddos involved in the kitchen to whip up these delicious little muffins that will showcase those strawberries from the farmer’s market so nicely! We love that they are sugar-free, too! Preheat the oven to 400`F. Lightly grease 2 mini-muffin tins and set aside. In a medium bowl, sift together the dry ingredients and set aside. In a large bowl, mix together the yogurt, oil and egg until well-blended. Next, add the flour mixture to the wet ingredients in the large bowl until mixed. Gently fold in the strawberries. Fill the mini-muffin tins and bake for 10-15 minutes, or until a knife or toothpick in the center comes out clean. Oven temperatures will vary. Once cool transfer to a wire rack. “Mom” enjoys these muffins warm, right out of the oven! Treat Dad this Father’s Day to a spicy fillet of red snapper, made lovingly in the comfort of your own home! Wash and pat dry fish fillets. Combine lime juice and hot sauce in a shallow bowl. Add fish fillets and marinade ½ hour. Combine flour, salt, and chili powder together in a shallow bowl. Remove fish from marinade and pat dry with paper towel. Dredge in flour mixture on both sides. Set aside. Heat olive oil in a WearEver Cast Lite Fry Pan over medium heat. Cook the fish on both sides until golden brown. Remove from skillet. Add the salsa, garlic and combine with the broth or water, cumin, oregano and olives. Bring to a simmer. 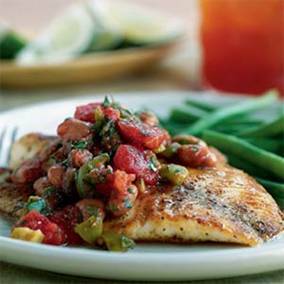 Gently place the fish in the salsa mixture and spoon some salsa over the fish. Cover and cook over low heat for 10 minutes or until heated through. Reserve ¼ cup of the sauce. Spoon and divide remaining sauce between two shallow soup bowls or serving plates. Place ½ cup of rice in center of each plate and top with cooked fish. Spoon reserved sauce over fish and rice and sprinkle cilantro. Serve with avocado slices and lime wedges. You’ll need a rather large box to make a house but they’re easy to find. Large kitchen appliance boxes make fantastic playhouses for small children. If you aren’t in the market for a new appliance, stop by your local home improvement store and ask if there’s a box that you can have. Even if it’s broken down for recycling, you can whip it back into shape with some duct tape. Get creative with the house. You can add custom-printed stickers to the outside, strips from an old roll of wallpaper, or paint it to look like your own house. Cut out windows with a utility knife; add a door and roof “tiles” to make it look like a real house. Your kids will spend hours playing inside of your creation. You know those colorful rugs that are designed to look like towns complete with roadways? Instead of spending good money on a play rug, make your own out of a cardboard box. Pick a box that is large enough for your toddler to sit inside of and move freely. Cut off the longest side of the box, leaving about four or five inches around the edges. Draw a “town” on the inside bottom of the box, complete with roads, lakes and parking lots. With blocks, toy vehicles and plastic people, your child can play for an entire afternoon. 3. Cars, Airplanes and Trains; Oh My! You can make virtually any vehicle with two cardboard boxes. No matter what your child wants to “drive,” you can create it in under an hour. The only things you’ll need to create vehicles for your kids are cardboard boxes, duct tape and a utility knife. When your vehicles are complete, let your kids color them with markers or otherwise decorate them. All vehicles can be started by simple cutting a space in the top of the box that your child can slip into. A plan is finished by adding a propeller, wings and tail, all made out of cardboard. A car needs nothing but four wheels, and a train can be built just like a car, with another box added to the back for a caboose. Look online for inspiration; you’re bound to find dozens of pictures to copy from. If your child likes to pretend and you’ve got a box, you’ve got an instant toy. Cut two sides from the box, and cut a slit in the center of one piece, stopping about an inch from the top. Cut an inch off of the length of your other piece. Take the first piece and slip the slit you cut over the edge of your second piece, forming an “X” or “+” (think tab A into slot B). Stand your creation upright and you’ve got an instant structure. Paint your cardboard with acrylic or poster paints to make it look like a castle, house, hospital or any other type of building that will excite your little one. Do you have a budding artist on your hands? Why not make him his very own easel out of a pizza box and a single piece of cardboard? Sit the pizza box on the table so that the end you would open is facing away from you. Take a ruler and draw a line about three inches from the edge that is towards you. Carefully bend the top of the box back along the line that you’ve made, creating a crease in the box. Once you’ve made your crease, cut a second piece of cardboard that you can use to prop the lid open. Place the bottom of this piece of cardboard in the pizza box and tape the top end to the lip of your pizza box top. Once completed, you can tape a piece of blank paper to the “easel” and let your child make his next great work of art. You don’t have to spend hundreds of dollars on the next big toy in order to provide your child with hours of fun. Building toys out of cardboard boxes encourages your children to use their imaginations. At the end of the day, isn’t that what play is all about? Amy Chandler is a blogger with DiscountBannerPrinting.co.uk, one of the UK’s leading providers of labels and stickers. Follow her on Twitter @DBPamy. “There’s nothing to stop anyone who wants a garden from having one,” says Roy Joulus, CEO of Greenbo, www.greenbo.co, a company that designs award-winning innovative products for urban gardening including the new Greenbo XL flowerbox. • Remember, pale-colored surfaces increase the light your plants receive. 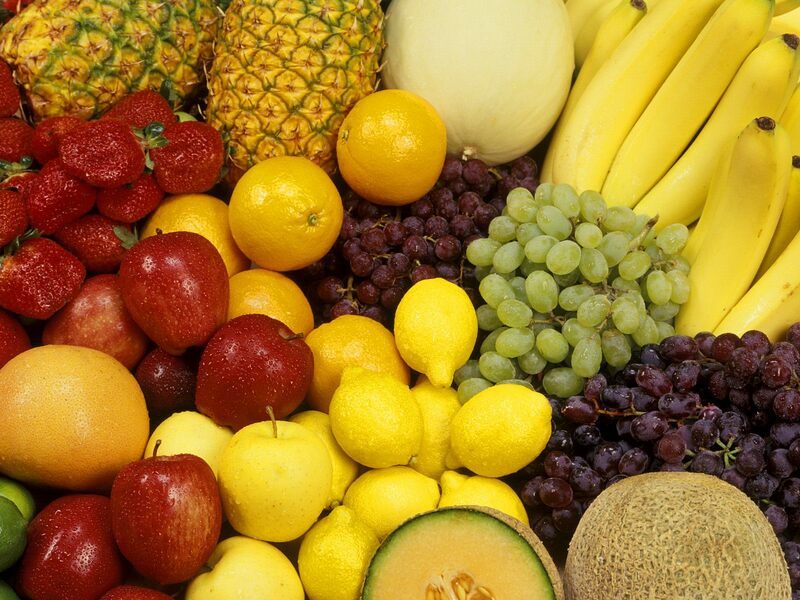 Plants in regions with short growing seasons usually need the full six to eight hours of light per day. • Bigger pots require less water and are less likely to blow over on high-rise balconies where the winds can be fierce. Terra cotta allows moisture to escape fairly quickly, which is helpful for people who like to water a lot. Non-porous plastic or glazed pots hold water longer and are better for windy balconies, where soil dries out quickly. Use brightly colored containers to add style and visual interest to your garden. • Most vegetable plants require even watering – don’t let them dry out completely and don’t keep them soggy. Apply water directly to the soil. • Make sure your containers have drainage holes or a drainage system. If they have an attached tray to catch excess water, don’t allow the plants’ roots to sit in the water, which promotes rot and fungus. Either empty the tray regularly, or use a design that holds the water away from the roots. • It’s important to use dirt that allows for good drainage. Most edible plants don’t like to sit in wet dirt, and soil without good drainage tends to become compacted – a difficult medium for plants that like to stretch their roots out. You can buy a sterile soilless potting mix, a soil-based potting mix, or mix up your own batch using 1 part compost, 1 part perlite and 1 part potting soil. • Don’t use garden soil or top soil, which won’t allow adequate drainage. • On windy balconies, top-dress your container with small rocks to keep the soil from drying out so quickly. Which Green Home Improvements Really Pay Off? Every homeowner has the goal of increasing the value of his property. And to this end he is likely to perform regular maintenance and repairs and possibly even undertake upgrades and all-out renovations in order to ensure that when he decides to sell this asset, it holds the greatest possible value. To that end, most homeowners want to make sure that the money they put into projects around the house is going to come back to them at the time of sale. In short, they want to opt for upgrades that have the greatest potential return on investment. And as most of us know, kitchen and bathroom overhauls tend to top the list. But what about green home improvements? With a growing marketplace clamoring for amenities that reduce their carbon footprint, perhaps eco-friendly improvements are a good way to increase the appeal (and asking price) of a property. The only real question: which green home improvements are likely to show the best return? Although the green movement is nothing new, having been around for several decades at this point, the mainstream popularity of eco-friendly living is a relatively recent phenomenon. So there is not exactly a lot of data out there to tell you which green home improvements are going to produce the greatest payoff at the time of sale. That said, you can probably make an educated guess as to which upgrades are more desirable to prospective buyers. It doesn’t take much common sense to realize that anything that saves a new homeowner money is going to tip the scales in your favor when it comes to selling, so you need to look at what each home improvement actually adds to your property. Consider, for example, the difference between adding reclaimed wood flooring, which is a green way to get the hardwoods you want without denuding more forests, and installing solar panels in order to cut back on energy consumption. 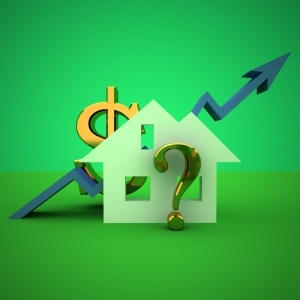 Which do you think will hold more value for a prospective buyer? While it’s true that the average homeowner may be drawn to hardwoods, the truth is that the potential return on investment for flooring is quite low. At best you won’t have to drop your price to account for the buyer’s desire to install new flooring. And it might make your house more appealing. But when you have solar panels on your list of amenities, it reads as dollar signs for a new owner because it implies that they can alleviate some or all of the burden of paying an electric bill. That’s a major bonus for most buyers. Other features that might fit the bill, so to speak, are the inclusion of items like double-paned windows, low-flow toilets, aerated faucets, a tankless water heater, and even a gray-water system. You might also include native and drought-resistant landscaping to cut water consumption. These types of add-ons will appeal to a large portion of prospective buyers. Of course, there is a growing group of greenies that is looking for eminently eco-friendly homes of the LEED certified variety, so if you want to go all out there is a market for extremely green homes (and they often fetch a fantastic price since devoted eco-enthusiasts are willing to pay top dollar). But if you’re merely looking to attract the eye of the average person seeking New York, Chicago, or Philadelphia real estate to purchase, then green upgrades meant to save the homeowner money are sure to show the best returns. 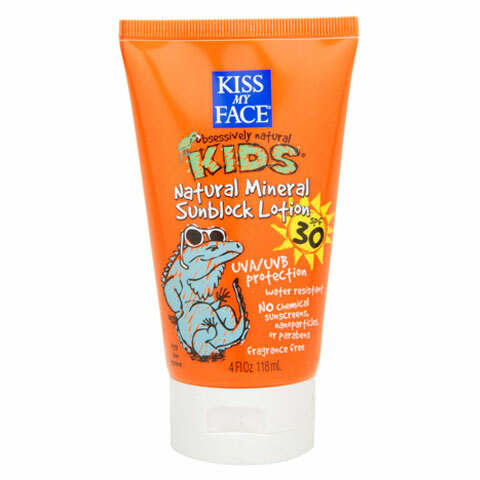 http://tinygreenmom.com/wp-content/uploads/2018/07/logo-sm.png 0 0 Tiny Green Mom http://tinygreenmom.com/wp-content/uploads/2018/07/logo-sm.png Tiny Green Mom2013-06-07 18:24:252013-06-07 18:24:25Which Green Home Improvements Really Pay Off? Pizza is a fun and easy dinner to prepare. If you want high-quality premade dough, find out if your local pizza place sells some of its dough. Preheat the oven to 475°F. In a small pot over medium heat, add the tomato sauce, oregano, thyme, and sugar, and bring to a simmer. Remove from the heat and allow to cool slightly. Place the pizza dough into a lightly oiled bowl and allow to rise until doubled, about 45 minutes. Dust a clean counter with the flour. Turn the dough out onto the dusted surface and flatten with your hands. Dust a rolling pin and roll the dough into a 12- to 14-inch circle. Sprinkle the cornmeal on a pizza pan or baking sheet before placing the shaped dough on top. Allow the dough to rest for 10 minutes. Spread ½ cup of the tomato sauce mixture on the dough, leaving 1 inch at the edge for the crust. Pinch the edge of the dough to form the crust. Evenly sprinkle on the cheese, and top with the arugula and tomato slices. Bake for 10 to 15 minutes, or until the crust is golden and the cheese has melted. Allow to cool for 5 minutes before slicing and serving.